As an alternative to overlaying multiple radar charts (see Overlaying Radar Charts), you can tile charts horizontally, vertically, or in both directions (see Using Multiple Classification Variables in Radar Charts) using the ACROSSVAR= or DOWNVAR= options. Each cell in the output corresponds to a level of the classification variable. By default, the cells are arranged in alphabetical order of the values of the variable from top to bottom. The key cell is the left cell (corresponding to PROCESS = Process A in this example). 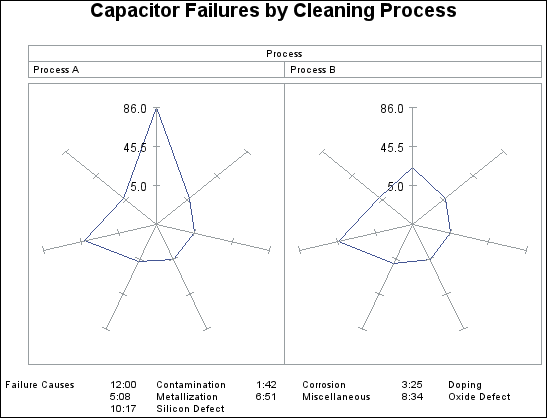 The output in this example shows that the main difference in the frequencies for Process A and Process B is a drop in contamination using Process B.
ACROSSVAR= specifies variable PROCESS as the categorical variable whose values determine the number of charts that are tiled. STARLEGEND=CLOCK generates a legend that identifies spoke positions. Value CLOCK determines that the positions are identified using a clock metaphor. STARLEGENDLAB= specifies the category-legend label Failure Causes.